A family of four who travelled to Mexico to celebrate a wedding has obtained £12,300 in compensation after an accident and an outbreak of illness ruined their holiday. 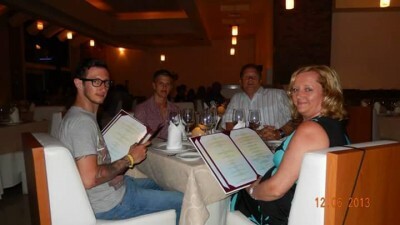 The family from Cheshire had booked a 2-week, all-inclusive stay at Gran Caribe Real Resort & Spa in Cancun, Mexico through tour operator Thomas Cook. During the first week of their stay in May 2013, the Blakeway family experienced symptoms of diarrhoea, nausea and stomach cramps â interrupting the planned wedding celebrations. âBirds were spotted flying through restaurants and glasses were soaked in dirty waterâ Mrs Blakeway said. âAfter the outbreak was noted the restaurant was closed for two days whilst men disinfected the area and drinking glasses were exchanged for plastic cupsâ she added. As well as suffering gastric illness during the holiday, Mrs Dianne Blakeway also sustained a back injury when she fell as she was entering a restaurant with her son.Â She fell heavily onto her back and suffered a soft tissue injury which caused her severe pain and discomfort. The Resort initially denied liability, but after proceedings were issued, Mrs Blakeway received £6,500 compensation for the injury she sustained. Tracy Stansfield, an experienced solicitor at Your Holiday Claims, negotiated settlement of Mrs Blakeways personal injury claim. âI am very pleased that we were able to help Mrs Blakeway obtain compensation for the injuries she suffered as a result of the accidentâ. Anne Thomson, Head of Travel Law at Your Holiday Claims, dealt with the illness claims for Mr & Mrs Blakeway and their two sons. £5,800 compensation was agreed with tour operator Thomas Cook. Anne Thomson commented: âThis has been a very distressing time for the Blakeway family, having all suffered illness in addition to Mrs Blakeways injury. I am pleased we were able to obtain a good result for the family. Mrs Blakeway commented on her settlement: âI am delighted with the final outcome and am so grateful to Anne and Tracy for all their hard work.Â They obtained an excellent settlement for us and always kept us informed as to how the claims were progressingâ. Has your holiday abroad been ruined by an illness or accident? If you’ve suffered a holiday illness or injuries caused by an accident abroad, you could be entitled to bring a claim directly against your tour operator right here in the UK. The dedicated solicitors here at YourHolidayClaims have years’ of experience helping people receive the compensation they deserve in claims against tour operators Thomas Cook, First Choice and TUI (formerly Thomson Holidays). If you’d like to find out how much compensation you could receive, call us now on 0330 100 2851. Or, you can arrange a call back by completing our online holiday illness enquiry form here.